The stress of new beginnings and putting your best foot (and face) forward can cause breakouts. School is in session and today our lesson plan is what you can do to lower your chances of that first day breakout. The unpleasant fact is that there are many reasons that blemishes can suddenly erupt. Fortunately, I’ve got you covered! Here’s some questions you should ask yourself. Chances are if you are guilty of a few of these, you may be increasing your chances for that dreaded back to school breakout. Are you washing your linens infrequently? Let’s face it (pardon the pun), but if you haven’t changed your bed linens, especially your pillow cases at a minimum weekly, you are at risk. Hair oils, saliva – we all drool a little (Okay, we all do), makeup, dirt, etc. – they are all landing on your poor pillow and, then, back on your face! Do you wash down your cell phone and anything that comes in contact with your face regularly? Here’s a simple rule: if you touch something germy and then you touch your phone, chances are those germs are going to end up on your face, so wipe down your phone or use an antibacterial phone wipe at least twice a week. If you still have a home phone (yes, you) – when’s the last time you cleaned the handset? Yup – gross. Do you touch your face…excessively? Just like your cell phone, think about all the things your hands come in contact with. If you are going to put your fingers to your face, well, make sure they are clean, ladies! While we don’t recommend washing your hair daily, if your hair is oily and your bangs sit on your forehead you may be experiencing more breakouts than usual. If you are prone to “bang-line” blemishes, we recommend pulling them back off your face a few times a week or using a dry shampoo that absorbs excess oil between classes. Do you wash your make-up brushes regularly? This is a biggie! Write this on the chalkboard 20 times: I will wash my brushes weekly. NO EXCUSES! Don’t shower after a workout? Chances are you have sweat and dirt sitting on your skin, possibly clogging your pores and breeding bacteria. I recommend using an all natural (alcohol free) toner immediately after you workout as it removes the sweat and sebum buildup. I remember pulling all-nighters too…but believe it or not, ‘beauty rest’ isn’t just a saying. 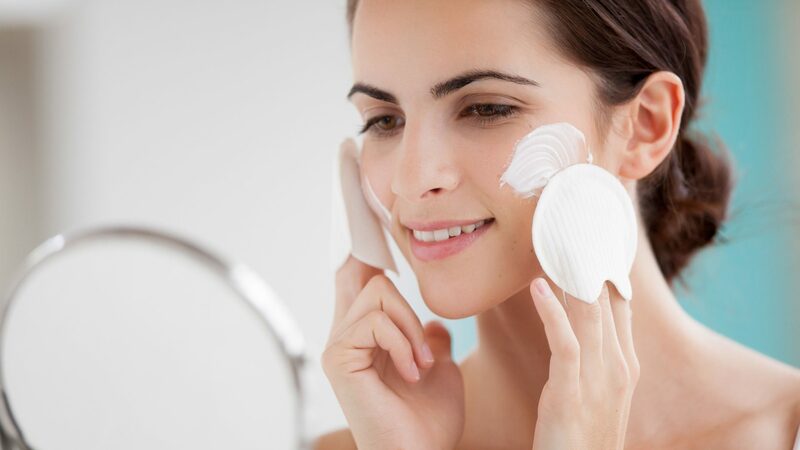 Make sure you are getting 6-7 hours a night to keep your oil levels healthy and your skin smooth & clear! If you aren’t already worrying about grades…don’t get an F in face washing. Here’s the cheat sheet to a straight A. While we could go on and on about how best to avoid acne, some of it is out of our control too. Things like your monthly hormonal cycle, medications, your diet and, yes, genetics, can affect your skin throughout the year. The important lesson is to do what you can to get ahead of the curve and not to stress about it.